Thoughtful article in Museum: "Are DJs, rappers and bloggers ‘curators’?" Been to Chabot Space & Science Center? Take their survey! 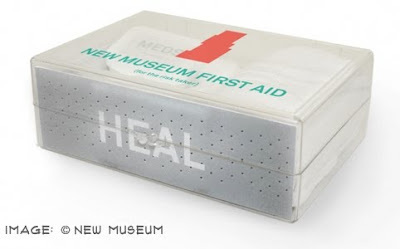 Just before the holidays, I received an email about a "New Museum First-Aid Kit" which is "...packed with items every art lover needs, including a New Museum gift Membership." This is a fun idea, and an innovative way to wrap the gift of membership. Yet the costs for this particular "gift" are in the realm of a significant tax-deductible donation to the museum. 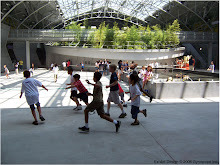 What about beloved museums in the country, large and small, who have unique communities and unique identities... could a nuance of this idea benefit them and help raise funds while also reinforce their identity or mission? Perhaps curating an annual museum "gift box" could be worth trying out. In the next couple of posts I'm going to look at what this might look like for a variety of institutions and sketch up some possibilities. Labels: "gift of an idea" "new museum" "museums" "gifts", "maria mortati"